Read/write heads are the most sensitive and delicate part of your hard drive. If your hard disk drive is clicking or beeping, bring it to our data recovery lab today. The magnetic read/write heads are the workhorses of the hard drive. These components work harder than any other part of the hard drive. In addition to being relatively quick to wear out, read/write heads are also delicate, and physical trauma can not only blind them but also make them damage other parts of the hard drive, putting the safety of your data in jeopardy. If your hard drive’s read/write heads have failed and your hard drive is clicking, you can count on our hard drive repair experts to reunite you with your data. Don't let bad read/write heads keep you from your data. Gillware is here to help. What Are the Read/Write Hard Disk Heads? 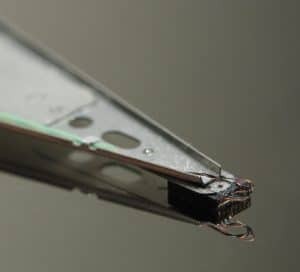 The read/write heads in your hard disk drive are very tiny copper coils on the ends of long arms that function somewhat like the needle on a record player. These are responsible for creating all of the data on your hard drive by altering tiny magnetic regions on the hard disk platters and reading it back. If the read/write heads break down, reading your data becomes impossible unless a professional replaces the heads with a compatible donor pair. Every read and write operation your hard drive performs gets carried out by its read/write heads, which hover over the hard disk platters. They are capable of picking up and altering the electrical signals produced by the billions of magnetic sectors on your hard drive’s platters. These electrical signals are the data that lives on your drive. When the read/write heads in your hard disk drive break down, the only way to salvage your data is with the help of hard drive repair experts like the ones here at Gillware. The only safe way to perform delicate head swap operations is in an ISO-5 Class 100 cleanroom lab by highly-trained engineers with the proper tools for hard drive repair. When your hard drive is in need of a head swap, only trust the professionals to do it. What is the function of a read/write head in a hard drive? The components of your hard drive are constantly in motion. Your hard drive’s spindle motor spins your drive’s platters at thousands of revolutions per minute, typically 7200 or 5400 RPM for consumer-grade drives and up to twice that for some enterprise-grade hard disk drives. While the platters spin below them, the heads are constantly darting across the radius of the platters and either reading or altering the magnetic fields on the platter. Hard drives today have many platters stacked on top of each other. The read/write heads are also arranged in a stack as well. Each head reads data from one surface of the platters. Some hard drives have more platters than they have heads. Often, the only physical difference between a 500-gigabyte Western Digital hard drive and a 750-gigabyte Western Digital hard drive will be that one has fewer heads than the other, as one or more platter surfaces will not be used. A thin cushion of air produced by the platters’ rotational speeds helps keep the heads aloft as the platters. The read/write heads maintain a distance a scant few nanometers from the platters. With every read and write command, the arms which hold the heads over the platters shift to position them over the correct sector. All of these mechanisms are very delicate and their breakdown is a matter of when, not if. This is tiring work, and the read/write heads are very fragile. Over time, they begin to wear down. In the early stages of failure, heads can mess up their read or write operations. Users will start to hear the hard drive click of death occasionally. The hard drive is clicking because it is failing to detect the magnetic tracks that encapsulate the binary data. Attempting to write new data with clicking heads can result in file corruption. If a set of read/write heads writes the wrong data to a firmware sector, it can turn your hard drive into a brick. Give it enough time and that intermittent clicking will become regular clicking, like the sound of an analog clock. This is because your hard drive’s read/write heads are now completely blind and can do nothing but swing back and forth over the platters, never engaging with any of the data on the platters. There’s no hope for getting even the slightest bit of data off of the hard drive in this condition… unless you send your drive to hard disk repair specialists like us here at Gillware. What makes read/write heads break down? Read/write heads are also a common point of failure in hard drives. An excessive physical trauma or sudden loss of power can cause the heads to impact the platters. This will often destroy the heads. The platters, too, are somewhat fragile, and can sustain damage this way. Clicking hard drives that are having consistent i/o errors should be shut down at the first sign of trouble if the data on the drive is critical and not backed up. Failed heads don’t just keep you from accessing the data on your hard drive. Damaging the platters can lead to irretrievable data loss. If your hard drive begins to make a steady ticking noise or grinding noise, stop running it immediately. This could be a sign that its heads are damaging the platters. Our heads failure data recovery technicians have the tools and experience to salvage your data from your crashed hard drive. How Does Heads Failure Data Recovery Work? Replacing read/write heads is a tall order. Read/write heads are delicate, easy to destroy, and hard to replace. It takes an engineer with steady hands, head replacement tools, and keen eyes to remove one set of heads and replace it with another in a clean head swap operation without damaging something. 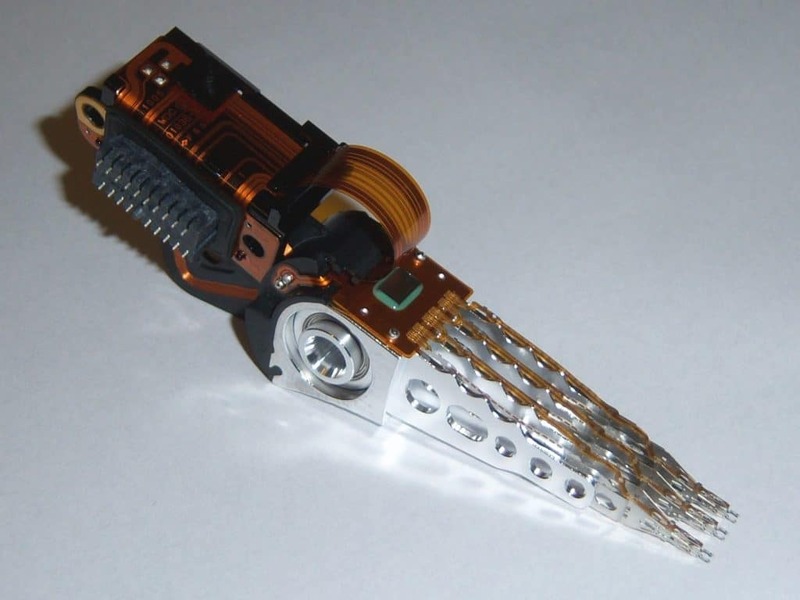 Every model of hard drive has read/write heads that are just a bit different from each other. At Gillware, we keep a massive library of donor hard drives on hand. Just about every model of hard drive is somewhere in our library. And yet compatibility issues still arise. Hard drives are so sophisticated nowadays that even drives of the same model will be subtly different from each other, and finding compatible donors can be difficult. Does Opening Up a Hard Drive Void Its Warranty? When you do it, yes. When we do it, no. If your hard drive is still under warranty and you want to get your data back before you send it to the manufacturer to get it replaced, there’s plenty of reason to be concerned about having your hard drive opened up to be repaired. Gillware has warranty arrangements with all major hard disk drive manufacturers, including Seagate, Western Digital, and Hitachi. As long as a hard disk drive is operated on in our cleanroom lab, nothing we do to it will void its warranty. This is one of the many reasons why you should always head straight for a professional data recovery lab like Gillware when you have a broken hard drive. Having a library with over one hundred thousand donor hard disk drives on hand and easily accessible, though, means our engineers rarely have to take too long to find compatible donor parts. The calibration parameters will differ even on two drives that came off of the assembly line within seconds of each other. And so even with ample donors, finding a good set of heads can require trial and error. It may take a few tries, and we may have to manipulate with the hard drive firmware a bit, but eventually, our engineers will find a set of heads that works and skillfully swap them from the donor to our customer’s drive. The new parts may not work optimally–in fact, donor parts are almost never an optimal replacement in a failed hard disk drive–but even a stopgap solution is better than nothing. Next, we start salvaging the data from the failed hard drive. Our proprietary data recovery tool HOMBRE can manipulate the performance of a hard drive in a way that normal data recovery software can’t as it combs through the data on your hard drive. This gives us a high degree of flexibility. Even if a newly-repaired hard drive’s performance leaves much to be desired, our engineers can still salvage data from it. In many heads failure data recovery scenarios, the heads will need to be replaced several times. With each set of read/write heads, our engineers read more and more of the hard drive. Our focus is on reading as much of the used area as possible. Eventually, the condition of the hard drive may degrade to the point where no more data can be read off of its platters. When a hard drive fails, it is not long for this world. Our engineers always go after the user’s most critical files first for this reason. But in most cases, our hard drive repair experts manage to get all of a customer’s data safely off their broken hard drive. Why Choose Gillware for My Heads Failure Data Recovery Needs? With fifteen years of data recovery experience, we understand better than anyone else the harsh reality that hard drives often fail without warning. Few people plan for the expense of data recovery. And in general, people don’t like spending money and getting nothing in return. This is why Gillware’s data recovery evaluations are completely free and there are no upfront charges for any part of our hard disk recovery services. In fact, we even offer to cover the cost of inbound shipping. We can create free prepaid UPS Ground labels for any clients in the continental US. Data recovery is often an unplanned-for expense. Even when you’re aware that your hard drive can die at any time, that doesn’t necessarily mean you’ll be prepared when it fails. There are no safe alternatives to a data recovery lab when you need data recovery from a hard drive with failed heads. There are no viable DIY data recovery methods in this situation. Without the environment, expertise, and equipment of a real lab, your data is as good as gone. Our engineers assess the hard drive’s condition in our Class-100 cleanroom workstations. We inspect the read/write heads and data storage platters for damage. We determine whether the platters need burnishing and how difficult it will be to replace the read/write heads. We use all this data to formulate a price quote and probability of success. The price quote is not a bill. You have a chance to review the cost and possibility of success before signing off on any recovery work, and even then, you don’t see the bill just yet. If you approve the quote, our heads failure data recovery engineers put in the work to salvage your data. We only charge you for our efforts after we’ve successfully recovered your critical data. If we can’t recover everything from your drive, we show you a list of results so that you can help us determine how successful our efforts have been. If we do not recover your most important data, you owe us nothing. Our read/write head data recovery engineers are highly-skilled and have world-class training and equipment at their disposal, from heads replacement tools for hard drive repair to cutting-edge software. We have data recovery tools no other data recovery lab in the world has. We will do everything in our power to recover your data. When you send your failed hard drive to Gillware, you can rest assured that your data is in good hands. Without the safe environment of a quality data recovery lab, your data is as good as gone. There are no DIY solutions to hard drive heads failure, and chances are extremely slim that anybody without the proper tools, even if they know computers backward and forwards, can reliably repair HDDs with failed heads. Fortunately, a clicking hard drive doesn’t have to be the end for your data when so many world-class labs exist, and especially not when you can send your hard drive to the best of them all. Gillware has provided quality data recovery for failed HDDs for over 15 years. Our top team of world-class engineers has successfully recovered data in over one hundred thousand cases. From the newest Western Digital HDDs to ancient Quantum relics, there’s nothing our engineers haven’t dealt with before. If you can't access your data, your heads may be bad. Get it sent to Gillware today.